Offering excellent features, at an amazing price. The newly designed 30mm Sport Dot from Hawke Optics, weighs only 139 grams including the mount. The Sport Dot features a three position brightness control and easy finger adjustable windage and elevation turrets. Supplied with both 9-11mm and weaver mounts. 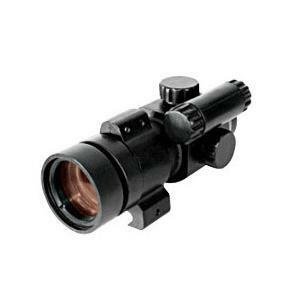 Hawke Red-Dot sights offer many features as standard. 4 or 5 M.O.A red dot with eleven brightness settings, fully coated optics and a wide field of view to provide extra light gathering. Positive windage and elevation adjustment turrets, 5" at 50 yards. Unlimited eye relief and fixed focus enables use on pistols, shotguns and bows. Hawke Red Dot measures 4 M.O.A. 1 M.O.A covers a 1" area at 100yds. All Red Dots can be adjusted for brightness. You usually get what you pay for, and this sight is cheap and useless. One look through this sight will show you a parallax error that is totally unacceptable on anything better than a kiddies toy gun. Hawke do some great accessories for airguns and I am surprised that they've allowed this sort of inferior equipment to leave their factory. Avoid this one like the plague, and look for something that can be accurately zer0'd in without this dreadful parallax error.